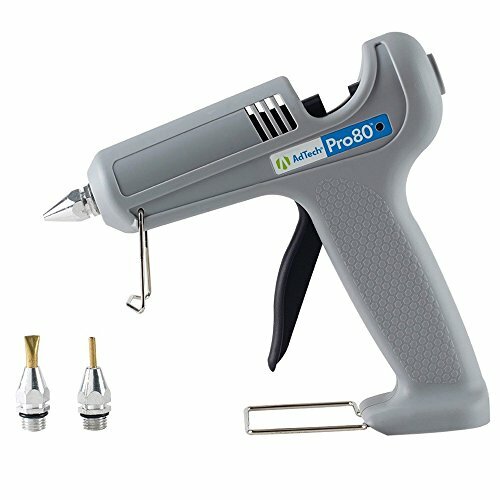 The AdTech Pro80 is an entry-level industrial hot melt glue gun with 3 interchangeable nozzles (fine standard and flat/wide). It's perfect for light commercial and indutrial use, or for heftier DIY projects around the home. The Pro boasts an output of up to 2-pounds of glue per hour. Its powerful 60 watt PTC heating system heats up fast. The comfortable and ergonomical 4-finger trigger helps eliminate fatigue during heavy use. TAKE ON HEAVY-DUTY PROJECTS - Use this tool for standard wood, paper, cardboard and fabric crafting, or take-on more hefty projects that require bonds for rubber, plastic, and metal. CHOOSE YOUR TIP - Fine, standard and wide-tip nozzles are included, to maximize your capability with a single tool. PLUG AND PLAY - The Pro80's 60 watt PTC heater heats up fast, so you can work on your project quickly. FOUR-FINGER TRIGGER - The Pro 80's high-leverage trigger is designed to give you more control for straighter lines and tighter dots. PROP IT YOUR WAY - Comes with 2 removable stands, so that you can prop your glue gun the way that you prefer. TRUST A BOND THAT HOLDS UP - Pair the Pro80 with AdTech’s Pro-Strength glue formula for a strong bond that lasts and lasts. TRUST A BOND THAT HOLDS UP - Pair the Pro80 with AdTech's Pro-Strength glue formula for a strong bond that lasts and lasts. AdTech glue guns are USA-Engineered, Designed, and Quality Controlled. For best results, pair with AdTech's quality, USA-made Full-Size hot glue sticks. If you have any questions about this product by Ad-Tech, contact us by completing and submitting the form below. If you are looking for a specif part number, please include it with your message.